Black Seal has a rich, intricate flavour, well balanced and nuanced with butterscotch, vanilla and caramel. Or, as expressed up by the Beverage Tasting Institute when they recently awarded it their highest honour, the Platinum Medal: 'Deep, assertive and highly flavoured. Very fragrant with herbal sharpness. At the finish there is a softness and elegance. A most complex, unusual spirit'. The corks were secured in place with the use of black sealing wax, prompting people to refer to the brand as "Black Seal". A lovely dark smooth rum mixes well and good neat or \"grogged\". There is a spicy note in the finish that I am still working out almost a citrus butterscotch if that makes any sense, which sets it apart (but not necessarily better than) other dark rums. This Rum you will have to respect or it will knock you off your feet. It is not the smoothest Rum I have tried however it is a very bold and robust Rum. After trying many good Rums from Barbados (Mount Gay), Guyana (El Dorado) and Trinidad and Tobago (Angostura) I was bought this by accident and i still can't look back after this great Rum. Flavours are smooth and rounded and i cannot add a mixer to it without a bit of shame. A MUST to try for any enthusiast. I love this rum. We were on holiday in Bermuda in May and got stuck into their Dark n'Stormy cocktails straight away and basically lived on them for our 10 days holiday! Fantastic rum, gorgeous aroma and flavour and with the added ginger beer, makes it a great drink whilst basking in the warmth of Bermuda. My bar just had the Goslings rep in last week and although I am not a big rum fan...the lady did convert me into a damn good drinking session before I staggered back onto the bar...this is great...bit on the sweet side but great all the same. And now I've got a place to buy a bottle from...happy days ahead!!! We've lived in Bermuda, and now we're back in blighty, we miss Goslings like we missed our family when we were there! If you get a taste for Black Seal, there's no going back to any other Rum. Best drunk Bermudian style, as a "Dark & Stormy" on the rocks with ginger beer. Thankyou 'thedrinkshop' for helping us re-descover Bermuda! Ed: It's a pleasure! 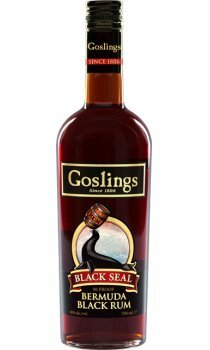 Having spent some time in Bermuda, I am already very fond of Goslings rum. It beats the pants off any other rum. When mixed with ginger beer it becomes a "dark and stormy". My favourite drink. I have struggled to find an importer of it until today!!!!!! Ed - Yippee - Have you tried Goslings Gold as well?